It’s easy to get drawn in by the fact they have very high star ratings in the Google Play store. One I used rewarded you for leaving a 5-star review. Hence why high start ratings may exist for such rubbish apps! One that I am enjoying so far though is called Opinion Rewards and is by Google. Type it’s name into the app store on your smartphone and it should come up, it has a green and white chart type logo. Here is how it looks on my Samsung, it might look slightly different to you depending on your region. The figures you’ll see in this review are in Pounds Sterling because I am in the UK, but it is available in the USA and other countries. How does the app work and what do I get? Using the app Google will ask you some questions. Each time they ask you questions it will literally take a few seconds to answer. The reason is they keep it really short and sweet. 4 answers it the most I’ve had to provide in one sitting. 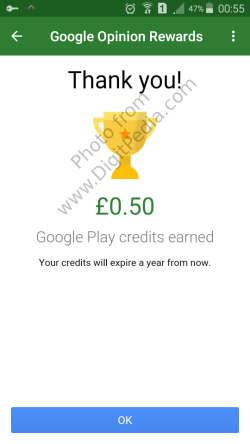 In return you get rewarded with credit for the Google Play Store. This will allow you to buy premium games, music or books using the free credit. It really is a cool way to get free stuff that normally you might not feel justified in paying for. Each time you get rewarded a nice thank you screen shows like this. The amount of credit you are rewarded with varies each time. I am in the UK and have had the app installed for a few weeks now. Here is how my history looks of questions answered. In the middle column you can see the value of each mini survey I did. The numbers vary quite a bit, almost as if they are just plucking numbers out of thin air! 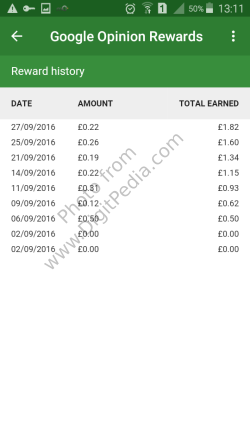 I’ve not used the free app for long enough yet to be able to reliably give an answer to how much you can earn. I’m looking at a couple of pounds per month. At that rate it will give me around £24 per year to spend in the app store. I think that’s excellent considering it is free to do and takes no time whatsoever! I enjoy some of the casual games made by indie developers that are listed in the app store. My plan is to continue to build-up my balance and then will upgrade a few indie games. If the pennies continue to come in at this rate hopefully I can get as many as 12 upgraded versions of games over the next year. Previously I would almost never buy upgraded versions because although I like to support indie developers it would be hard to justify. I think the most I ever spent was buying The Silent Age, which is a fun point-and-click game by the way that I would advise playing. Would I recommend downloading the app? 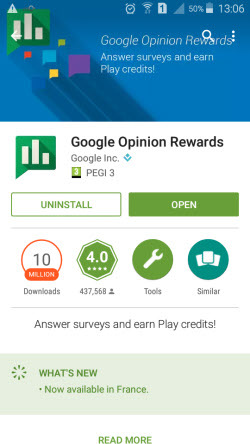 I absolutely would recommend Google Opinion Rewards. 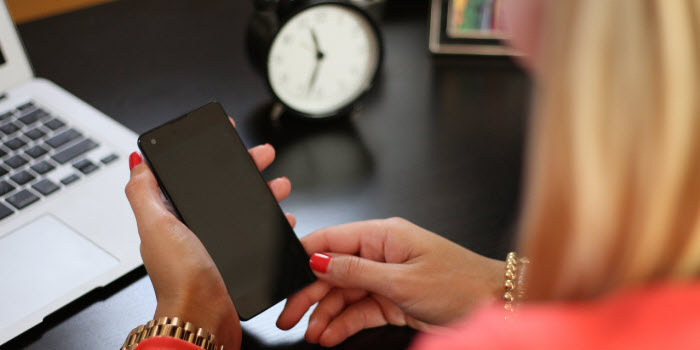 The amounts of money may appear very small, but it takes no time at all to complete the mini-surveys. As the months roll on the amounts will add up to worthwhile sums. Then you can treat yourself to whatever books, movies, apps or games you fancy getting! This is a good way to get the premium games which people often don’t buy just because of money. Such initiative will help put a brake on piracy. The problem with piracy is so bad on the Play store I’m not sure it will make much of a difference realistically. But for those of us who keep it clean you’re right, it is a good way to get premium games for free!